Sad to hear of the death of drummer Billy Mordue who passed away yesterday (Jan. 9) aged 86. Billy played with the legendary George Evans Orchestra at Newcastle's Oxford Galleries during the 1950s then later, after leaving the Oxford, at the Blue Parrot (now the Potter's Wheel) in Sunniside. The Blue Parrot, one of the first out of town nightspots in the north east, featured the Ken Maddison Trio (Maddison on piano, Eric Dobbing on bass and, of course, Billy on drums along with singer Ethna Campbell) and were very highly regarded. After that he joined the George Ricco Quartet (pictured) at the Cavendish Club in Newcastle. 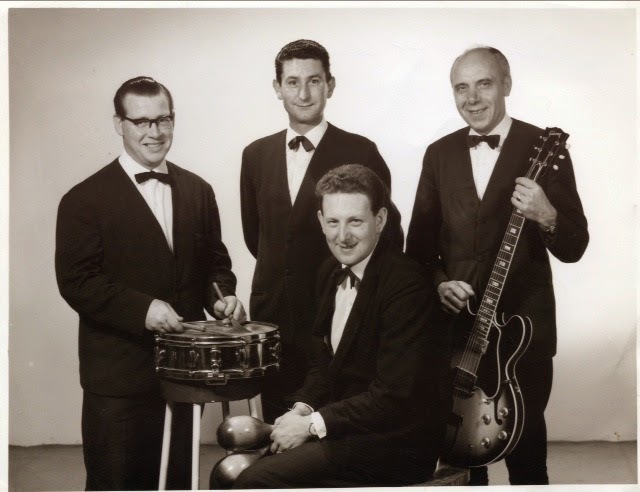 In the photo Billy is far left along with Andy Milne (bass); Charlie Smith (guitar) and, sitting, pianist George Richardson ("Ricco"). In 1984 he was reunited with George Evans who reformed his band for his (Evans) 70th birthday with a dance at the Mayfair Ballroom and a concert at the People's Theatre. The Peoples gig had ten saxes, ten brass, four rhythm and two vocalists and included Tommy Whittle, Roy Williams, Stan Coates, Alan Rudd, vocalists Ivy Barnes and Johnny Moran and most of the other top guys of the time (Syd Warren, Arthur Mowatt, Mike Gilby etc.) The Carol Kidd Trio were also on the bill. I was fortunate enough to be in the audience and it was truly a memorable occasion - not least because of Billy Mordue's drumming. When the above photo appeared on BSH in November 2012 Malcolm, Billy's son in law, informed us that Billy was in the late stages of Alzheimers but that good music still got his feet tapping! 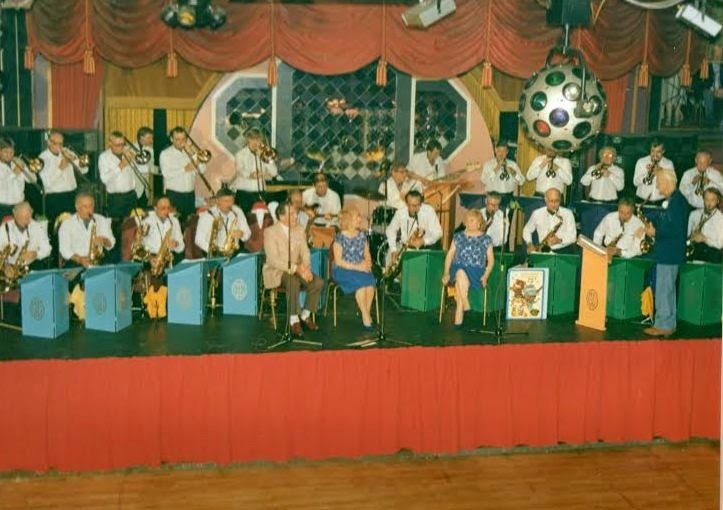 In the photo on the right Billy Mordue is in the centre of the picture taken at the Mayfair in 1984. (names). PS: Funeral details will be posted when available. Very sad - Billy played for me at the Tyne Theatre along with George Richardson for a production of Bugsy Malone. Lovely bloke. Hello Lance. Billy's funeral service is to be held at Mountsett Crematorium, Dipton at 3:30pm on Tuesday 20th January. Friends are very welcome. Thanks Malcolm - he deserves a good turn out. Sad to hear about Billy. I remember that night very well, such a pleasure to be there.